The omega-3 fatty acid (FA) concentration is low in patients with coronary heart disease (CHD). Supplement of omega-3 FA improves cardiovascular outcomes in patients with CHD and heart failure (HF). However, plasma omega-3 FA and its role for prognosis in HF patients have not been examined previously. In this study, we explore the prognostic value of omega-3 polyunsaturated FA in HF patients with major depressive disorder (MDD). Plasma was obtained from HF patients with MDD who participated in the Sertraline Against Depression and Heart Disease in Chronic Heart Failure trial. FA methyl esters were analyzed by the method of a flame ionization detector. Weight percent is the unit of the omega compounds. The primary outcome was survival which was analyzed using Cox proportional hazards regression modeling. A total of 109 depressed HF patients had adequate volume for completion of the FA assays. 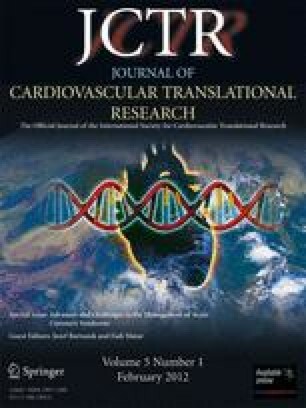 Plasma total omega-3 (hazard ratio [HR] 0.65, 95% confidence interval [CI] 0.43–0.98) and EPA_0.1 unit (HR 0.73, 95% CI 0.56–0.96) were significantly associated with survival of patients with HF and co-morbid MDD. The results suggest that low plasma omega-3 FA is a significant factor for reduced survival in HF patients with MDD. The authors would like to thank Eileen Bailey-Hall of Martek Biosciences Corporation, Columbia, MD and the Martek Biosciences Corporation for the significant contribution in regards to processing plasma samples and the FA analysis. We would also like to thank Dr. Steve Rozen of the Duke-NUS Graduate Medical School Singapore in Singapore for his contribution of data analysis and interpretation. The study was funded by the SADHART-CHF study (R01-MH063211) and R21 MH076178 by the National Institute of Mental Health (NIMH) Bethesda, Maryland. • Dr. Jiang received salary support through the NIMH research grant, and a minority supplement award for the biomarker study affiliated to the SADHART-CHF grant. • Dr. O'Connor has received salary support through the NIMH research grant and is a consultant for Martek Biosciences Corporation. • Dr. Kuchibhatla received salary support through the NIMH research grant. • Dr. Cuffe has received salary support through the NIMH research grant. • Dr. Krishnan has received salary support through the NIMH research grant. • Dr. Martsberger has received salary support from the NIMH research grant. • Linda Shaw: nothing to disclose for this study. • Dr. Fiuzat: nothing to disclose for this study. • Dr. Oken is a consultant to the Martek Biosciences Corporation. • Dr. Kaddurah-Daouk: nothing to disclose for this study. • Dr. Steffens has received salary support from NIMH for the metabolomic study. • Dr. Baillie: nothing to disclose for this study. All authors had access to the data. The preliminary result of the omega fatty acid study was presented at the 2010 American College of Cardiology Annual Meeting in March 2010 in Atlanta, GA.
Lesperance, F., Frasure-Smith, N., St-Andre, E., Turecki, G., Lesperance, P., & Wisniewski, S. R. (2010). The efficacy of omega-3 supplementation for major depression: A randomized controlled trial. The Journal of Clinical Psychiatry. doi: 10.4088/JCP.10m05966blu. Kromhout, D., Giltay, E. J., & Geleijnse, J. M. (2010). n–3 Fatty acids and cardiovascular events after myocardial infarction. The New England Journal of Medicine. doi: 10.1056/NEJMoa1003603.